The image, the print - it's what we take photographs for, right? Ever since I can remember it's always been drummed home that the only thing that matters at the end of the day is the photograph. Forget cameras, materials, etc, and concentrate on the end result. Maybe that's a truism if you're a pro and your livelihood depends entirely on what you deliver to the customer but should we amateurs be held to the same standard? I don't think so. Obviously, we're all out there trying to take killer photographs but we should never underestimate - nor feel we need to hide - the pleasure we get from using nice cameras and lenses and the whole photography process from selecting a film for the shoot to standing in a landscape in the fresh air when we'd otherwise not have a sufficient excuse to be out in the field. In fact, it was dissatisfaction with digital cameras that was part of my decision to go back to film. I love film and darkroom prints but I also really enjoy using good cameras - one of the reasons that I ended up with so many of them! My Nikon D700 is a great picture-taking machine but it can't compare with the likes of a Nikon F when it comes to sheer enjoyment of the picture-taking process. You'll remember that I've been selling off quite a number of cameras and lenses that I've accumulated with the promise that, to make up for it, I'd get myself one really nice camera, maybe a Leica or a Contax RX? 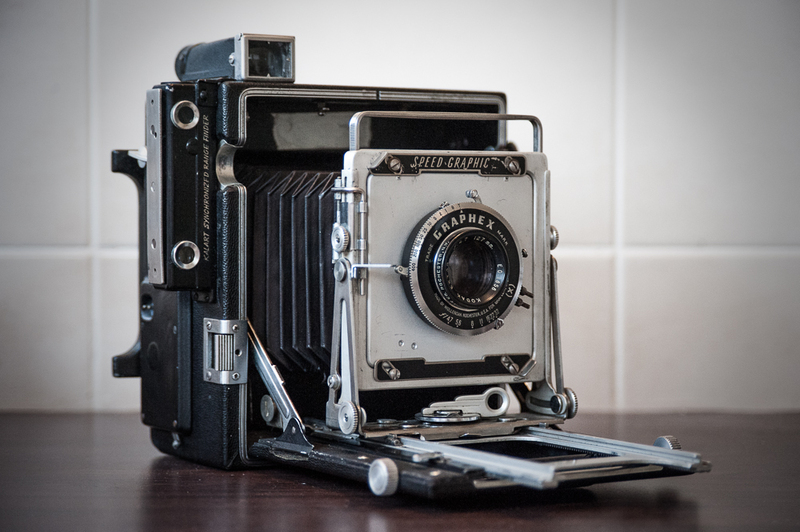 Well, I actually went and bought a 1950s Speed Graphic instead. I couldn't really justify another 35 camera - the idea, after all, was to reduce their number and buying another one seemed a bit daft. 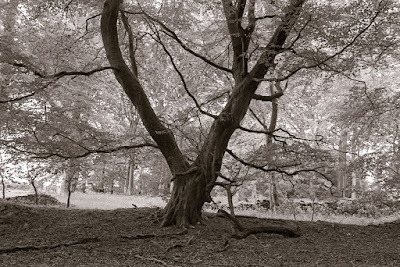 I got it from a guy on the Film and Darkroom Users (FADU) forum - and how much nicer it was than buying one on Ebay. My first pic from the Speed Graphic. 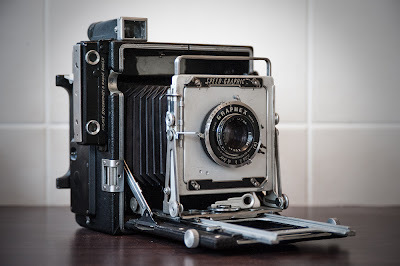 Last year I modified a half plate Goerz Tenax from the 1920s to take a 5x4 back and was intending to use it for some large format work but when I put it on a tripod and turned it 90 degrees the tripod socket was wrenched from the body. It's an easy enough matter to glue it back in but I think I realised that, whilst it will be interesting seeing what the old Zeiss lens is like, if I wanted to do large format in a more serious way I'd need something a bit more reliable and user friendly. Having said that, the Speed Graphic isn't exactly an easy camera to use as there are a few things you have to keep in mind on every shot - a shooting workflow, if you like - but it will no doubt get easier the more I use it. Above is the first image from it. Yes, it's a pic of the top of my stairs again! This time it's a paper negative converted to a positive in Lightroom. I read up a good deal about paper negs before trying this and the biggest problem is taming the contrast in the negative. I used old paper developer and pre-exposed the paper in camera at zone 1 - and the contrast was still hellish. It's basically soot and whitewash but the image has a definite "something" about it that I like (the streak across the middle is a mark on the scanner platter but I couldn't be bothered scanning it again). Not knowing the ISO of the Silverprint paper I was using, I guessed around 5 ISO which gave me an exposure of - wait for it - ten minutes at f32. I didn't know the paper's reciprocity characteristics either so I shot another paper negative with a 20 minute exposure. Both are so contrasty that it's difficult knowing what the right exposure is! The ranges of tones in the scene is so great that I don't think there's any way of compressing everything onto a sheet of enlarging paper but it's a quick way of learning how to control the contrast inherent in the process. Composing an upside down image takes a bit of getting used to. I cheated this time by getting out my D700 and photographing the image on the ground glass before checking it right way up to see if it was OK. I'm not sure if I could be bothered carrying the DSLR into the field but it's certainly a useful accessory, effectively performing the roles of polaroid back and light meter as well. The good thing about these paper negatives is that the camera was set up right outside my darkroom. I was able to cut a few sheets of 5x4 paper, expose them and then go straight into the darkroom to develop them. It isn't quite the instant feedback I used to get from the screen on the DSLR but it's not too tardy. Next time out, I'll use a yellow filter on the lens to reduce contrast, pre-expose at zone 2 and stick with the old developer and see how it goes. I did have a Speed Graphic before but it was more than 20 years ago and I only shot two negatives with it before selling it on. I just didn't have the time at that point. Now, I should be able to get used to the camera and have a project in mind photographing WWII relics in my area - I'll maybe start with my brother. Haha! (Sorry, John). With a 5x4 film negative, the prints should be excellent but, as I've said, it's not just about the image and I'll have great fun using such an old but capable classic. That Speed Graphic looks a beautiful instrument. I'm sure you will enjoy using it. For me the process of shooting is very much up there with the result. I enjoy the "no computers required" aspect of shooting with older cameras, just about the polar opposite of my day job (inside, working with computers all day). This past weekend I spent some time out with the camera, enjoying the outdoors and making some shots. Probably spent a good 4 minutes on average carefully setting up, composing and metering each one. I find it to be a very relaxing pursuit. I do like that I can have something to show for it afterwards, though. Hi Bruce ... Love your blog site here. I have a 5 x 7 and a very large 8 x 20 and just love using them. Yes, it's a very different process and you do enjoy the use of the nice equipment, large, beautiful lenses, film, etc. I have also come to enjoy the smell of my print paper (I think Ilford smells best). I am very much in agreeance about there being much enjoyment in the process as well as the results. I think people do get too hung up on the final image sometimes. I started out 4x5 last year with a Busch Pressman model D, it's a fantastic camera. I just wish lens boards weren't so hard to make/come by. Interesting complication you introduce with the "whole house as polaroid camera" routine. I have been shooting with a 1923 Agfa Ansco 8x10 film camera for a little over a year now and it does require great commitment to deal with the vicissitudes. I wish I could say I look forward to every outing and subsequent wet work session but is kind of a pain as you are finding out. I am not good enough in film work to nail gamuts and compositions in a shot or two of one subject, but I do take great delight in the yoga of the effort. With you on that Bruce , I don't carry my monorail 5x4 + accessories (22kg)into the Yorkshire dales just to capture an image on 5x4 film. I do it because I like using the basic manual process of the camera.A satisfying image is a bonus of course whatever kit you use. Enjoy the speed graphic ...and the resulting images. Paul Glover writes: "Probably spent a good 4 minutes on average carefully setting up, composing and metering each one." Blimey, Paul, you're a fast worker. For me, 20 minutes is nearer the mark if I'm working with large format kit. 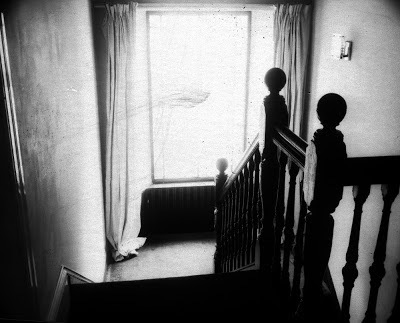 But those are 20 delightful minutes, and being slowed down like this is the beauty of LF photography. I sometimes forget about the final image altogether, so that the act of composition just becomes part of an abstract continuum. And then I climb back down out of my own backside and click the shutter – satisfied. To get back on topic, I've some old sheets of Centennial POP which are way past their shelf life (Chicago Albumen Works reckons something like six months, but I've had this box for more like six years). They are very very slow, but the resulting tones are beautifully soft, almost lush. Anyway, a couple of weeks ago I cut up a sheet to fit a dark slide, and set the camera up in my window with the shutter wide open and on T. I left it for the best part of two days. The result wasn't brilliant, but it made me think about paper negs. Now you've underlined those thoughts and I will definitely give the process a try. Stay tuned because Andrew Sanderson, quite possibly the leading exponent of paper negs in the UK and maybe beyond, is a reader and will be contributing a guest post soon.